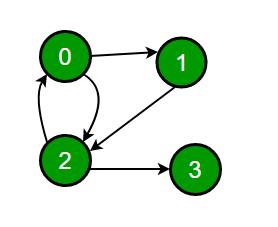 Given a directed graph, find out if a vertex v is reachable from another vertex u for all vertex pairs (u, v) in the given graph. Here reachable mean that there is a path from vertex u to v. The reach-ability matrix is called transitive closure of a graph. We have discussed a O(V3) solution for this here. The solution was based Floyd Warshall Algorithm. In this post a O(V2) algorithm for the same is discussed. Below are abstract steps of algorithm. Create a matrix tc[V][V] that would finally have transitive closure of given graph. Initialize all entries of tc as 0. Call DFS for every node of graph to mark reachable vertices in tc. In recursive calls to DFS, we don’t call DFS for an adjacent vertex if it is already marked as reachable in tc. Below is implementation of the above idea. The code uses adjacency list representation of input graph and builds a matrix tc[V][V] such that tc[u][v] would be true if v is reachable from u. // all reachable vertices for s.
// Mark reachability from s to t as true. DFSUtil(i, i); // Every vertex is reachable from self. // closure of a graph. // s to v as true. # Mark reachability from s to v as true. print "Transitive closure matrix is"